One of the early settlers in the Hawke’s Bay district, Mr. Francis Nelson, passed away at his home, “Rouncil,” Havelock North on Monday at the age of 68 years. The late Mr. Nelson who is a cousin of Mr W.H. Nelson of Woodville, took no prominent part in public affairs, but in indirect ways he was associated with the development of the farming industry in this district. His wife, a daughter of the late Mr. J.N. Williams, predeceased him two years ago. Mr. Nelson was born in England and came to New Zealand about 16 years ago. He was associated for some time with Nelson’s Ltd., and Tomoana Freezing Works and afterwards took up directorship of some public companies. 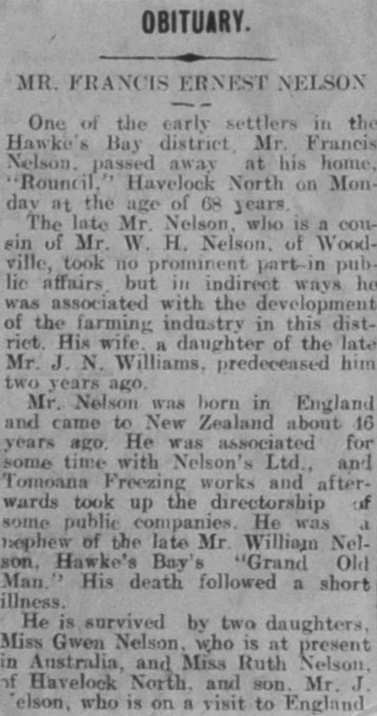 He was a nephew of the late Mr. William Nelson, Hawke’s Bay’s “Grand Old Man.” His death followed a short illness. He is survived by two daughters, Miss Gwen Nelson, who is at present in Australia, and Miss Ruth Nelson of Havelock North, and son, Mr J. Nelson who is on a visit to England.